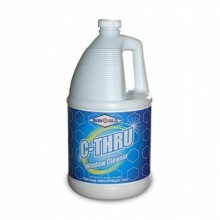 Click the button below to add the C-THRU - Non-Ammoniated Glass & Window Cleaner to your wish list. This non-ammoniated, non-butyl, ready-to-use, heavy duty glass cleaner features advanced surfactant technology to clean even the most stubborn types of deposits. High performance, streak free, commercial strength formula leaves glass bright and clean.